I think Robert Pattinson has just a LITTLE more class than that. And yes, he's probably hurting like hell, but I refuse to think that he's acting like Bella in New Moon. 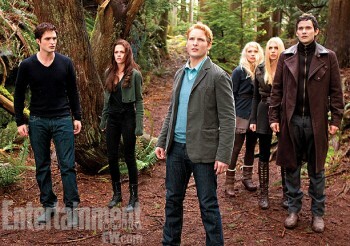 So, get excited, twihards! 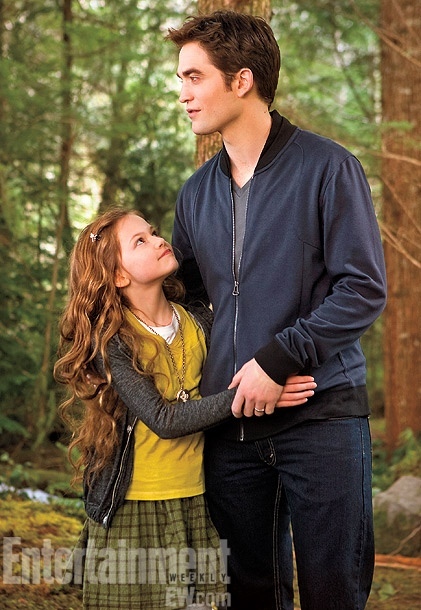 It's more Breaking Dawn stills!! And yes, our real life Edward and Bella may be going through a tough time right now, but they aren't their characters, as they've enforced before. So cut them each some slack, and get focused on the movie coming out in a couple months! Who's excited!? Mrs. EC LOVED your post and i am excited, cant wait for BD2!! I love this pic most of all. I think Rob with young children is such a sweet thing or especially with the baby in Water for Elephant. He has a way with children. They respond to him so will from Ruby Jerins who played his little sister Caroline in Remember Me and the young actress who played Christina Ricci's daughter in Bel Ami. He is a natural with children. He will be a very good father one day. Well, I must confess, i never loved Bella and never will. My heart was always Edward's in this story. so, i will go to see the film, for Edward, and only Edward. And because Rob plays Edward, than I go for him. I'm not really interested in his personal life, that is his. If he want to live with such a woman let him be. Maybe my adoring will lessen, but never mind. This happened with another actors (harrison ford because Calista Flochardt)in my life, but that never hurt them. So not will hurt Rob if I won't see his films because my opinion about his personal life. But not, i will see his film if those would be good. I'm waiting not for the Blaclist... never loved those themed films. But Rover... should be good. But sometimes I have a feeling he is on the same way than Orlando Bloom..
Hey Yashi I loved ur post and completely agree with u, the media has just blown those pics out of proportion. Rob will defiantly forgive and forget. Gosh everyday these paps come out with new stories the U Haul moving truck, the drunk calling stuff, Rob staying at Reeses house, Kristen staying with her OTR director, God these two are mature and independent enough, but the worst of all I heard is that Kristen being banned from the Cosmopolis premier god Rob would never do something like that. I don't believe in any of these stories made up in the past few weeks. For all u knw they have already sorted there differences and will still make it together. I feel Rob and Kristen have a Special connection and he will defiantly give her one chance. I didn't notice that Renesemee has Edwards jaw line. She really does favor them. I love all the pics. Carlisle hair even looks better here.